The Buy Local Norfolk directory goes to print every six months. Each spring we print 8,000 copies and in the autumn we print a further 5,000 fully updated copies. All our members are entitled to a completely free entry in both editions of the directory. We know that having these directories printed is only half the job, they do us absolutely no benefit by remaining in the box, so over the sunnier months we physically hand out directories at the many events we attend and exhibit at, for example; Royal Norfolk Show, Wayland Agricultural Show, Aylsham Show, Cromer Carnival, South Norfolk on Show, Norwich Lanes Summer Carnival, Old Buckenham Airshow, Greenbuild, Norwich Lord Mayors Procession etc. We are extremely grateful for the support of Norfolk County Council’s library service who, every six months, kindly distribute 1,000 of our members directories across the libraries of Norfolk. Many of our members have directories in their reception areas, with some handing out directories directly to their customers, and we know that some of our members will pop a directory in with goods sold to their customers. We offer all members the opportunity to increase their brand exposure by placing an advert within the directory, this costs from just £50 for a quarter page advert. Our deadline to receive ‘print quality’ artwork for inclusion in the spring edition is 31st March, and for the Autumn edition it is 10th October. Quality of artwork: Please supply print quality pdf with 3 mm bleed. Alternatively you can view a pdf of our current Directory here. 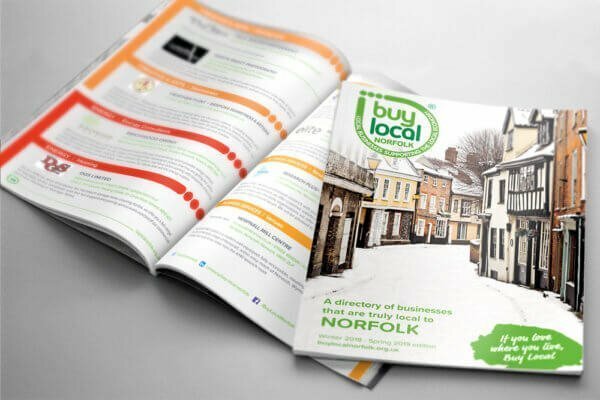 Save 10% on the advertising cost within the Buy Local Norfolk Directory by booking two consecutive editions with the same advert. We can have your advert professional designed for you for a flat rate. We will supply the finished artwork to you for further use.